Most of the time spent on an ignition problem is not the repair itself, it’s diagnosing the misfire code, conducting rounds of trial-and-error repairs and sometimes uninstalling and re-installing ancillary engine components. When a cylinder is not contributing and a misfire begins ticking up consistently, endless things might be the cause. Things like: the injector, a coil or spark plug, a compression problem, a valve issue, and more. Narrowing down the diagnostic paths when solving misfires will cut time spent on repairs and ultimately get cars in-and-out of bays faster. 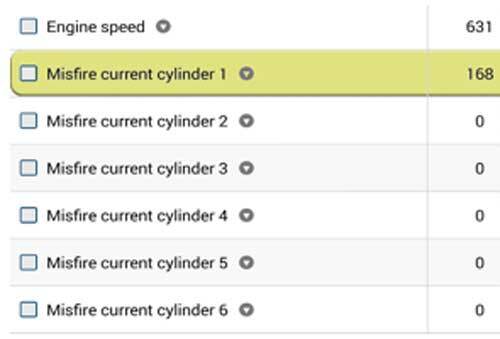 Using a lab scope to perform a current ramp test on ignition coils is incredibly helpful for many “V” style engines that would otherwise require the removal of the intake manifold to swap out coils, injectors, or plugs during the diagnostic process. As a coil prepares to fire, it draws current (amps). A current ramp test analyzes the current draw of each coil by comparing it to the others. Coils should be relatively uniform in their peak current draw. To perform this test, first, inspect a wiring diagram for the ignition coils to identify a common power feed. As shown in Figure 2, a 4.2L engine’s common power feed is PCM1 fuse number 28 (15-amp fuse). Second, remove the fuse and replace it with a fused jumper lead. Install a current clamp around the jumper lead and start the engine, adjusting the scope to see the coil current events. 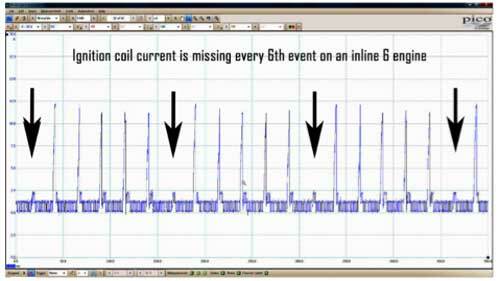 In Figure 3, you can see one coil current event is missing. Third, use the key on verify power has made it to pin A of ignition coil 1. Do this by load testing or voltage drop testing. If the power is good, verify the ground side control of the PCM is also good. (This test is like a noid lest test on a fuel injector.) Hook up a test light between pin A and pin B of the ignition coil and crank or start the engine. You should see a pulsing light every time the PCM commands the coil to turn on. If you do, the control circuit has been proven functional. The problem lies within the ignition coil. Also, in best practice, inspect the spark plug for fouling on a cylinder that was not firing. A common failure point in an ignition coil is its windings. Over time some ignition coils break down from heat and vibration, creating an open circuit. This was the above diagnosis. It’s important to choose premium ignition coils when performing ignition system repairs. A quality ignition coil uses a vacuum-sealed epoxy coating and tight primary and secondary windings. This ensures the longevity and performance of the coil through heat and vibration. In some cases, coils, spark plugs, or injectors are very easy to swap around to see if the misfire follows. This is not the case in many modern V6 or V8 engines, some of which require hours to remove the intake manifold and reach the back three or four cylinders. Using a lab scope to perform an ignition current ramp test prevents extended diagnostic time and effort. For more information about NGK ignition coils, please visit ngksparkplugs.com/ignitioncoils or contact the NGK Technical Support line at 877-473-6767.